When co-hosts Mary of Beans and Caviar, Melinda of Melbourne Larder and Enza of Io Da Grande announced that March's Daring Bakers' challenge was lasagna, I thought about passing on this one. I don’t usually skip any of the Daring Baker challenges, but lasagna falls outside of what I normally blog about here on Alpineberry (which is mainly pastries, baking and desserts). I admit I have blogged about a savory tart before, but that was about making a flaky pie dough. And, yes, I blogged about pizza for the October 2008 DB challenge, but that was more about making the yeasted dough for the crust. To me, making pizza dough seems to be more like making bread. I know that the key part of this month's challenge is to make our own pasta dough, but making spinach lasagna with a béchamel sauce and meat ragu feels more like cooking than baking. I know it's a fine line. Technically something is baked if it went in the oven. I guess you can argue that pizza also straddles the line between cooking and baking. But would a roast chicken be considered baking? I mean, it's baked but is it baking? I don't know. We could argue the semantics for days. 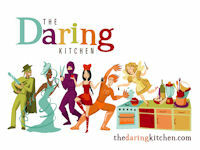 I think our hosts may have chosen lasagna as a way to celebrate the launch of our new website The Daring Kitchen and a new group called the Daring Cooks. Yup, that's right. We're no longer just Daring Bakers anymore. 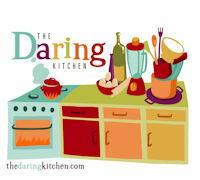 We're cooks now too, hence, the new Daring Kitchen. Even though the lasagna is the Daring Bakers' challenge recipe and not the inaugural Daring Cooks' challenge recipe, I'm not going to argue with the powers that be. After some consideration, I knew I could turn this month's challenge into something that I could post on my blog. I decided to create a sweet "lasagna" dessert. I wanted to be sure to honor the main part of this month's challenge - making the pasta dough. Instead of spinach pasta, I decided to make a sweet pistachio pasta dough. And instead of béchamel and meat ragu, I decided on a white chocolate mascarpone cream and a diced strawberry "ragu". 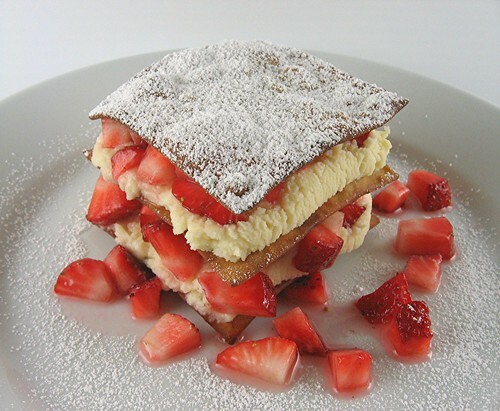 My idea was to deep fry the sweet pasta dough and then layer it with the cream and strawberries. I had to make up a recipe for the sweet pistachio pasta dough. Using the spinach pasta dough recipe as the basis, I omitted the spinach, decreased the amount of flour and added some sugar and pistachio paste. I used canned pistachio paste which is a mixture of ground pistachios, oil, and sugar. My dough was difficult to knead by hand and to roll out. It took some time but I managed to get the dough nice and thin. I think I built up some arm muscles working that dough. My resulting pasta dough wasn’t as elastic and stretchy as traditional pasta dough, but, for the most part, it had the texture and feel of fresh pasta. The dough wasn't as green as I wanted and it lost any semblance of green after I deep fried the pasta squares. The white chocolate mascarpone cream was very straightforward. I just made a white chocolate ganache, mixed in some mascarpone cheese, chilled the mixture and then beat it until fluffy. My ragu of strawberries was even simpler. Just dice some strawberries, toss in a bit of sugar and let them macerate for a few minutes. The sweet lasagna dessert was pretty delicious. The fried pasta squares had just a hint of pistachio and was just sweet enough. The cream was rich and decadent and the berries were sweet and tart. It was a good combination of flavors and textures. The only thing I didn’t like was my fried pasta squares were a bit crunchy so it was difficult to break through the top layer of the lasagna with a fork. The bottom two layers were easy to break since the cream and berries softened them a little. Overall, I would say it was a great success. To see the recipe for Lasagne of Emilia-Romagna, please visit our hosts Enza, Melinda, and Mary. Mound the flour in the center of your work surface and make a well in the middle. Beat together the eggs, pistachio paste, sugar and salt in a bowl. Scrape mixture into the well. Then gradually start incorporating shallow scrapings of flour from the sides of the well into the liquid. As you work more and more flour into the liquid, the well’s sides may collapse. Use a pastry scraper to keep the liquids from running off and to incorporate the last bits of flour into the dough. Don’t worry if it looks like a hopelessly rough and messy lump. With the aid of the scraper to scoop up unruly pieces, start kneading the dough. Once it becomes a cohesive mass, use the scraper to remove any bits of hard flour on the work surface – these will make the dough lumpy. Knead the dough for about 3 minutes. If it is too sticky to move easily, knead in some flour. Continue kneading about 5-10 minutes, or until the dough has become satiny, smooth, and very elastic. Wrap the dough in plastic wrap, and let it relax at room temperature 30 minutes to 3 hours. With a rolling pin, roll out a quarter of the dough at a time and keep the rest of the dough wrapped. Lightly sprinkle a large work surface with flour. Shape it into a ball and begin rolling out to form a circle, frequently turning the disc of dough a quarter turn. Keep rolling until the disc becomes larger and thinner. The goal is a sheet of even thickness. The sheet should be pretty thin (about 2 mm). Cut into squares about 3 by 3 inches. Repeat with remaining dough. Heat a pan half-filled with vegetable oil to 375F. 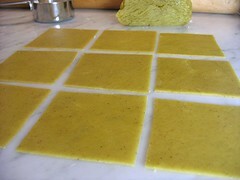 Fry the pasta squares in batches for 20-30 seconds, until golden. Carefully remove and drain on paper towels. Cool before assembly. Combine chocolate and cream in a heat proof bowl and set bowl over a pot of simmering water (or use a double boiler). Stir occasionally until chocolate is melted. Whisk in mascarpone and vanilla extract. Cover and chill in refrigerator for 1 hour. Using the paddle attachment on a stand mixer, beat until fluffy. Hull and dice the strawberries. Toss with sugar. The amount of sugar you need will depend on the sweetness of your berries. Let sit for 10 minutes. Top one fried pasta square with 2 tablespoons of white chocolate mascarpone cream and spread cream to cover the square. Take care not to break the pasta square. Top the cream with diced strawberries. 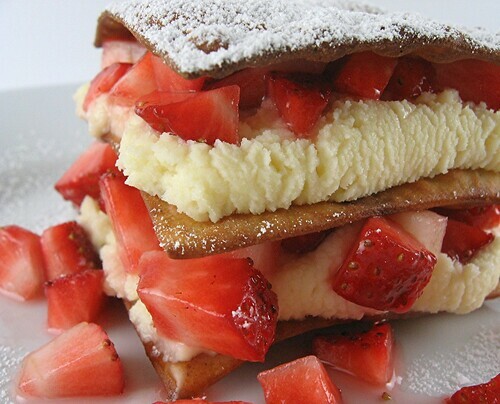 Repeat with another layer (fried pasta, cream, strawberries). Set a fried pasta square on top and dust it with powder sugar. Serve. That is such a sweet twist to the Lasagna I know. The more dessert lasagnas I see, the more I wish I stuck with my original idea to do a sweet lasagna! Your dessert lasagna is SO creative, and it looks beautiful! Well done! I just love the sweet line you stuck to Mary...it's a fine line but a beautiful one! What wouldn't I give to be sitting there & indulging in something as gorgeous as that! This looks wonderful, Mary. What an inspired dessert. Personally I don't mind a bit of crunch in my dessert. Looking at the first picture, I thought the layers were chocolate. This sweet version of lasagne looks beautiful and so delicious! A great creation! my first sweet lasagna of the day! love the idea mary (going to pinch it soon). you rock! looks beautiful..... m sure to try the sweet version next. Oh.. sweet lasagna! So creative and looks beautiful! Wow! what an drop dead gorgeous presentation...and, I'm guessing, a remarkable taste. I'm with you on the definition of "baking," but made the traditional lasagna. You are so imaginative :) And you make me want to try sweet lasagnas ! Loooove the sweet twist on lasagna!! Whoa, deep fried pistachio pasta?! I totally need that, like, now. I had a hard time with the savory thing as well, so I wish I had done a sweet lasagna instead. Yours looks fabulous! Looks beautiful and so innovative! This was my first DB challenge and I nearly sat it out because my blog is definitely a no-lasagna zone as well. But I thought I'd better go for it anyway since it was my first challenge. SO, so, so, SO good. I really wish I had tried a dessert instead--I keep seeing the dessert creations and they just look heavenly! That looks wonderful! I almost wish I'd done a dessert lasagna but I was really excited to make the noodles myself. Now I'm craving strawberries! Way to be creative on this. And I understand about the dilemma. Your end product is lovely, and the cream filling is a lovely combo of flavors I would love to try. This is absolutely gorgeous and a sweet diversion to the savoury! Love the pictures and the colours. my mouth is drooling, love the sweet twist on the pasta. I think I would be in love with this version and not be able to stop eating it! Never thought I can fry the sheets! Great idea! It looks fabulous! I wonder if poking the dough to make little holes would have made it easier to break apart? It looks delicious and I'm thrilled you took up the challenge anyway. This is such a nice twist! The sweet lasagne looks really yummy. What a 'daring' take on the theme! I love it :) Yours is only the second sweet lasagna I've seen and it looks diving! Your sweet lasagna looks utterly delicious. Had trouble imagining a sweet version, but yours is awesome! Looks really pretty, too with the strawberries. Yum....looks delicious! Wish I had been able to participate this time but I've been doing lots of baking for bake sales. Gorgeous! I've never had deep fried pasta sheets before. 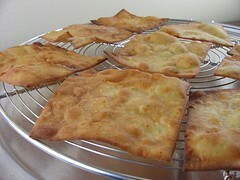 Was it similar in texture to what a fried wonton is like? Oooh my first sweet variation! And such a pretty one too. I did not know you could get pistachio paste. that is the most decadent looking lasagna i have ever seen! awesome job of making something sweet. i will have to try your recipe some day. great job! That looks amazing...at first glance I thought it was some variation of strawberry shortcake! Mmm, I love the dessert lasagne idea! Yours looks amazingly good =D. It is such a great dessert! Not only the presentation is great, the combination of flavors are even better. I'll make you a deal, Mary: you can come over to my house for a slice of the savory lasagne if you bring your gorgeous creation! Incredible Mary. I know you always are but this is really tops. That's my kind of lasagna. OUTSTANDING Mary! In true Daring Baker form, you came up with one of the yummiest looking desert lasagne's I've seen so far.. oh how I wish I had a slice in front of me RIGHT NOW! This is stunning, Mary. I love the flavour combinations that you put together... I just want to dive right in! i love that you made this sweet. nice! I definitely feel your arguments about baking vs baking. I guess a lot of us were surprised to be 'baking' lasagna, but I made it anyway mainly because I try not to miss any challenges this year; as a challenge to myself! I dó like your creative solution and I MUST have this pistacchio pasta (although I've never seen it anywhere here in the Netherlands)! my gosh--that's beautiful! so creative, and i love that you used pistachio paste in your pasta! Oh, goodness! This looks so delicious. This is the only post I have seen for a sweet lasagna. Thank you for sharing! I love the sweet twist on this month's challenge. HoHo! This is just taking the challenge to the limits!! Great twist! Great take on the challenge! I love that you used pistachios in your dough. Your twist on the lasagne challenge is utterly beautiful. Well done! i just felt in love for this lasagna... i must try this at home... wonderfull post! I have to say I'm slightly disappointed. What makes it baking is the dough. It might be yeast dough, flaky dough, shortbread or pasta, it's still dough. Deep frying is not baking either, but if you bake doughnuts, you will deep fry them, and those count as baking, don't you agree? I was hoping to see sweet baked lasagna, a little like the Jewish sweet kugels, with jam instead of meat or tomato sauce. I love cremy cakes with fruits, they are so light and great for sunny days!